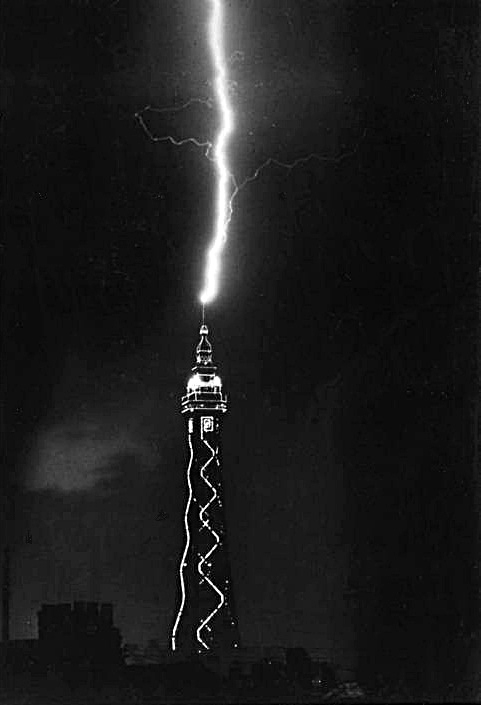 Lightning strikes Blackpool Tower, 1949. Blackpool Tower was struck by lightning during a sudden storm yesterday. A violent blue flash of light was followed by a large ball of smoke over the lightning conductor on the Tower flagstaff. The lightning went to earth, but broke up the roadway and cut a gas main. A photographer having noticed an approaching storm over Blackpool set up his camera opposite the holiday centre's tower, which was illuminated. He opened the shutter of the camera and, ten seconds later, a lightning flash descended to the lightning conductor on top of the tower. The developed picture disclosed this remarkable result. A VERY RARE PICTURE TAKEN DURING THE HEIGHT OF AN AUTUMN STORM A very remarkable chance picture of Blackpool Tower taken in late October as a lightning flash came in contact with the conductor.